It SNOWED this weekend!! Hallelujah! Was anyone else a little bit worried that it would start snowing in July?? There's something so beautiful and peaceful about watching the snow blanket the ground and turn the world white; it's almost like creating a blank slate for the new year. This year, one of my goals is to stop dwelling on the past. While it's important to learn from the past, we need to keep our eyes forward aimed at greater things for our futures. So with this look, I took that idea by "learning" from the past in the form of my favorite Summer florals and pastels, and endeavored into winter with a look suitable for the season. All it takes is the perfect balance of warm hues & textures to create a winter look. Hope this look inspires you to expand your wardrobe year round! Comment below if you have your own tricks to transition your closets from season to season! I wanted to take a walk on the lawn so I changed up my footwear from heels to more sensible boots that matched my belt & added burgundy red tights that matched my cardigan to create a cohesive look. Then my sister and I proceeded to play with the snow...because it'd be a huge waste of really great packing snow not to have some fun! Don't forget to enter the $150 MADEWELL GIVEAWAY!! It ends 1/16 & is open internationally! And I actually wasn't freezing! I think sometimes when it snows it's a smidge warmer. It was probably high 30s, low 40s out which at this time of year is bearable...for a few minutes! haha! Thanks for stopping by Julie!! You and your sister are TOO CUTE! And anytime you pull out a Kate Spade clutch, you know I'm going to swoon! Love this outfit and the post message!! Haha thanks Ashley!! 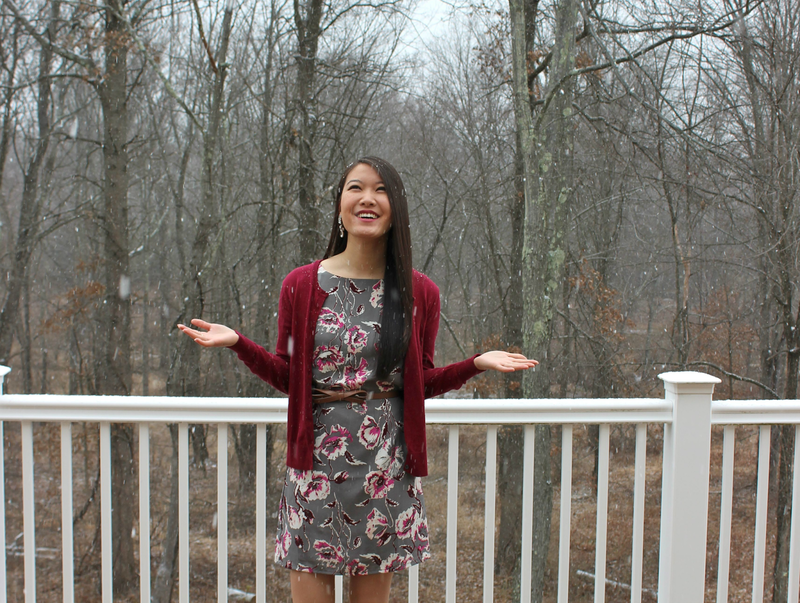 She was throwing snow in the air and some went down my dress so I was half shocked, half laughing! I love the pattern of this dress! wow, i love this! so creative. What woukd you consider the color you're wearing- burgundy or merlot?either way I love this outfit! I love the pattern/florals on that dress too! Also, your sisters dress is gorgeous! Good question!! I'd go with either...! Those are so lovely heels. They're my new favorite! Thanks! Great look! 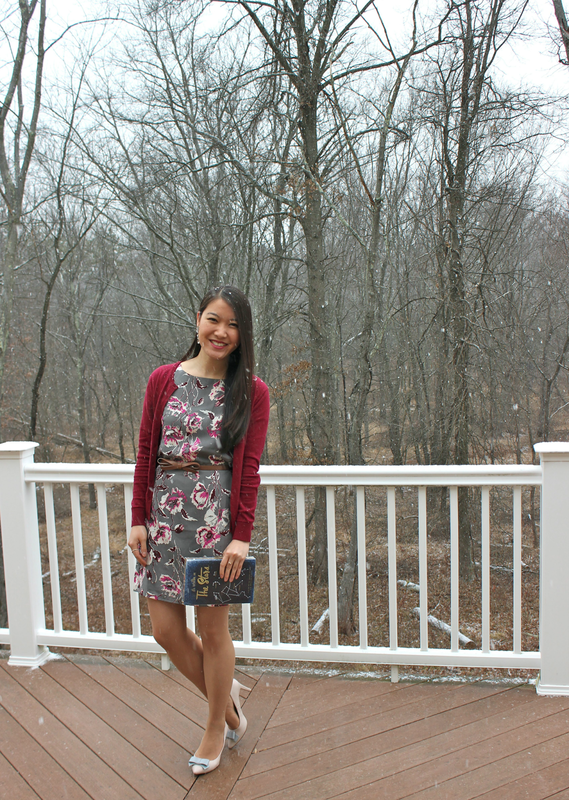 I love how you transitioned your floral print for winter! I love love how you styled this dress for winter, with matching tights and cardigan, and boots. So cute! I love your ourfit with the marsala cardigan. The colour suits you so well. Beautiful dress too, you look lovely! Ooo Marsala is a fun word to describe the color!! Thank you so much! You are brave to wear this dress with bare legs!!! I don't live in a place where it snows but when I was up in the mountains last year, it was so awesome to watch snow falling - it's just so magical. Haha! Don't worry, I wore pantyhose to block a bit of the chill! 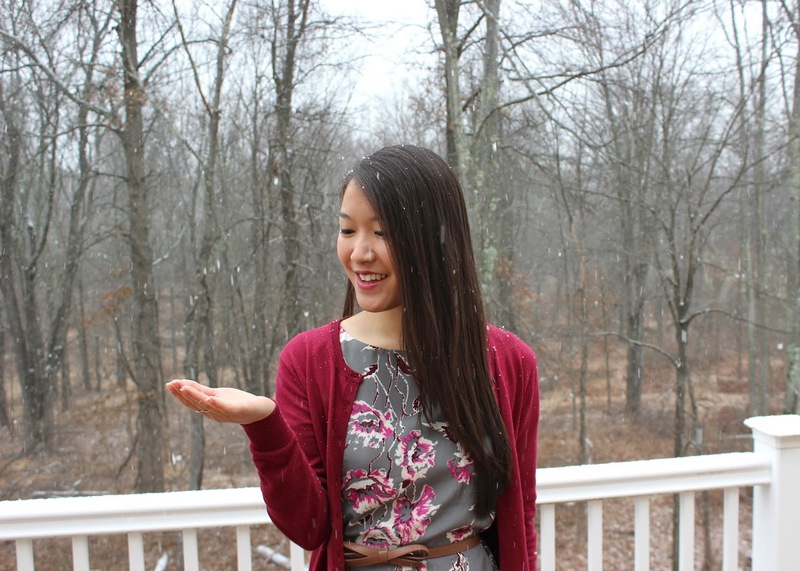 Snowfalls really are magical :) Thanks for stopping by Alice! FAB look! Such a beautiful print on that dress! Gorg! I love how the tights and the sweater match perfectly. This is classic and shows so much of your personality and style ! :) you really light up the room! or in this case the blog !lol thanks! The first bit of snow is always fun - it's when it starts to pile up and I worry it wont all melt until June that I start to worry! 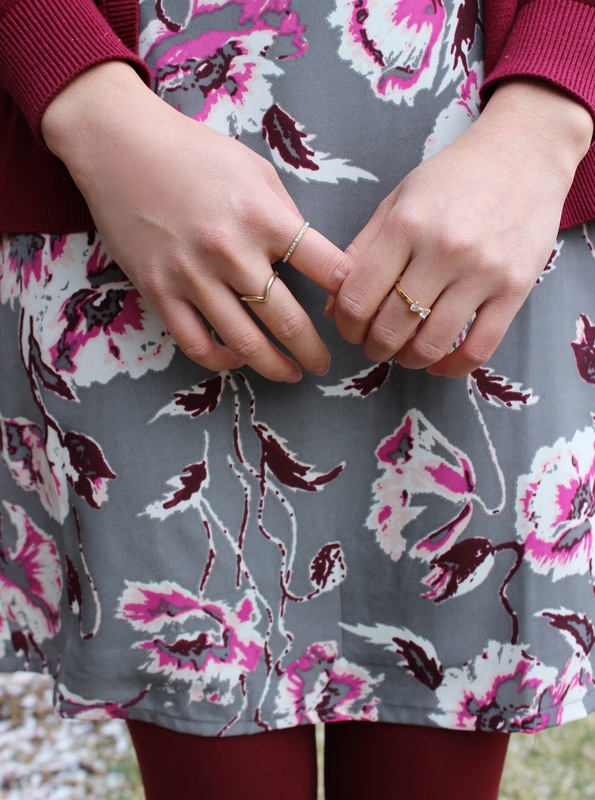 Love your pretty floral dress and delicate rings! Haha! I have the same worry!! :) Thanks for stopping by! You are so cute with your sister at the end playing with the snow! I'd love to play in the snow. it never snows here in Brisbane, not even in winter. Doesn't' get cold enough, although sometimes it feels cold enough for snow haha! Perhaps you can visit somewhere where it does snow to experience it :) I hope you get the chance! It's so fun! You are so cute out in the snow! Love that dress! Luckily we haven't had snow yet. It's 8 degrees and we have an ice storm headed this way. I'd rather have snow. Anyways, that's a cute winter look. Adds a nice pop of color. I love this outfit! 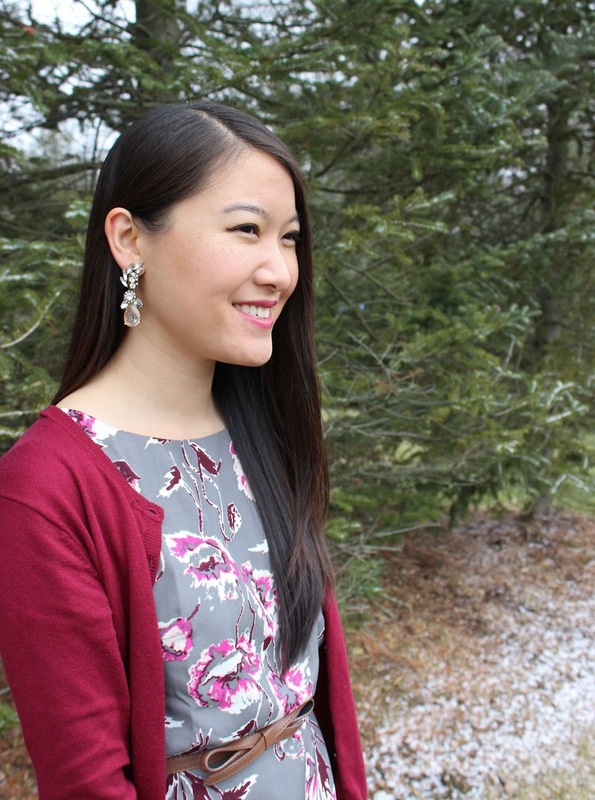 The dress is GORGEOUS and the cardigan really pulls the maroon out of the pattern! The dress is beautiful! And the gif really captures how much fun you had in the snow. Beautiful outfits! I'm loving florals for fall and winter this year. Thanks so much! It really is the perfect pattern for both seasons! Beautiful outfit, love the floral pattern! Thank you for joining the Trendy Wednesday blog link up. So pretty with the boots and tights! Your sister looks gorgeous too! I love the cardigan and it's gorgeous maroon color, then the floral dress and riding boots!! Deff my style awesome hook up! Yay! Love that you love the look! :) Thanks for stopping by Dana!